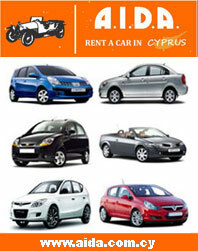 S. Sofronis Car Rentals started to operate in 2001 and it's a member of Pancyprian Association of car, rentals owners. Contact us at our Limassol car rental station and get our services throughout Cyprus. During the years of our corporation, we have provided services to a high number of clients and this is a consequence of our competitive prices and the high-quality services we offer . If you are planning to travel to Cyprus don't hesitate to become part of our long satisfied customers. Our professional, friendly staff awaits to serve you with best of excellence.